AVALIDE ® * (irbesartan-hydrochlorothiazide) Tablets is a combination of an angiotensin II receptor antagonist (AT 1 subtype), irbesartan, and a thiazide diuretic, hydrochlorothiazide (HCTZ). Hydrochlorothiazide is a white, or practically white, crystalline powder with a molecular weight of 297.7. Hydrochlorothiazide is slightly soluble in water and freely soluble in sodium hydroxide solution. AVALIDE is available for oral administration in tablets containing either 150 mg or 300 mg of irbesartan combined with 12.5 mg of hydrochlorothiazide or 300 mg of irbesartan combined with 25 mg hydrochlorothiazide. Inactive ingredients include: lactose monohydrate, microcrystalline cellulose, pregelatinized starch, croscarmellose sodium, ferric oxide red, ferric oxide yellow, silicon dioxide, and magnesium stearate. In addition, the 300/25 mg pink film-coated tablet contains ferric oxide black, hypromellose-2910, PEG-3350, titanium dioxide, and carnauba wax. Angiotensin II is a potent vasoconstrictor formed from angiotensin I in a reaction catalyzed by angiotensin-converting enzyme (ACE, kininase II). Angiotensin II is the principal pressor agent of the renin-angiotensin system (RAS) and also stimulates aldosterone synthesis and secretion by adrenal cortex, cardiac contraction, renal resorption of sodium, activity of the sympathetic nervous system, and smooth muscle cell growth. Irbesartan blocks the vasoconstrictor and aldosterone-secreting effects of angiotensin II by selectively binding to the AT 1 angiotensin II receptor. There is also an AT 2 receptor in many tissues, but it is not involved in cardiovascular homeostasis. 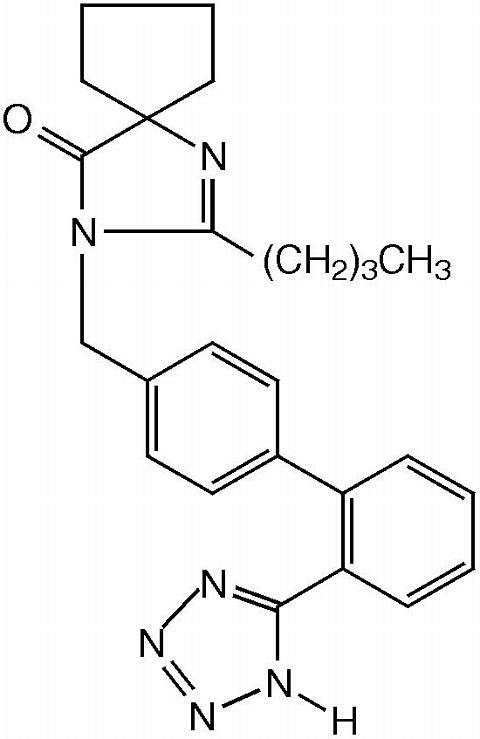 Irbesartan is a specific competitive antagonist of AT 1 receptors with a much greater affinity (more than 8500-fold) for the AT 1 receptor than for the AT 2 receptor, and no agonist activity. Irbesartan is an orally active agent that does not require biotransformation into an active form. The oral absorption of irbesartan is rapid and complete with an average absolute bioavailability of 60-80%. Following oral administration of irbesartan, peak plasma concentrations of irbesartan are attained at 1.5-2 hours after dosing. Food does not affect the bioavailability of irbesartan. The terminal elimination half-life of irbesartan averaged 11-15 hours. Steady-state concentrations are achieved within 3 days. 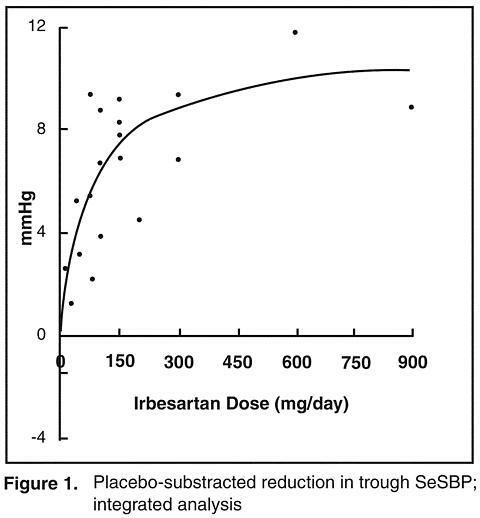 Limited accumulation of irbesartan (<20%) is observed in plasma upon repeated once-daily dosing. Irbesartan is metabolized via glucuronide conjugation and oxidation. Following oral or intravenous administration of 14 C-labeled irbesartan, more than 80% of the circulating plasma radioactivity is attributable to unchanged irbesartan. The primary circulating metabolite is the inactive irbesartan glucuronide conjugate (approximately 6%). The remaining oxidative metabolites do not add appreciably to irbesartan's pharmacologic activity. Irbesartan and its metabolites are excreted by both biliary and renal routes. Following either oral or intravenous administration of 14 C-labeled irbesartan, about 20% of radioactivity is recovered in the urine and the remainder in the feces, as irbesartan or irbesartan glucuronide. Hydrochlorothiazide is not metabolized but is eliminated rapidly by the kidney. At least 61 percent of the oral dose is eliminated unchanged within 24 hours. Irbesartan is 90% bound to serum proteins (primarily albumin and (alpha) 1 -acid glycoprotein) with negligible binding to cellular components of blood. The average volume of distribution is 53-93 liters. Total plasma and renal clearances are in the range of 157-176 and 3.0-3.5 mL/min, respectively. With repetitive dosing, irbesartan accumulates to no clinically relevant extent. Irbesartan pharmacokinetics have not been investigated in patients <18 years of age. In elderly subjects (age 65-80 years), irbesartan elimination half-life was not significantly altered, but AUC and C max values were about 20-50% greater than those of young subjects (age 18-40 years). No dosage adjustment is necessary in the elderly. In healthy black subjects, irbesartan AUC values were approximately 25% greater than whites; there were no differences in C max values. In hypertensive patients, angiotensin II receptor inhibition following chronic administration of irbesartan causes a 1.5-2 fold rise in angiotensin II plasma concentration and a 2-3 fold increase in plasma renin levels. Aldosterone plasma concentrations generally decline following irbesartan administration, but serum potassium levels are not significantly affected at recommended doses. In hypertensive patients, chronic oral doses of irbesartan (up to 300 mg) had no effect on glomerular filtration rate, renal plasma flow or filtration fraction. In multiple dose studies in hypertensive patients, there were no clinically important effects on fasting triglycerides, total cholesterol, HDL-cholesterol, or fasting glucose concentrations. There was no effect on serum uric acid during chronic oral administration and no uricosuric effect. The antihypertensive effects of irbesartan were examined in seven (7) major placebo-controlled 8-12 week trials in patients with baseline diastolic blood pressures of 95-110 mmHg. Doses of 1-900 mg were included in these trials in order to fully explore the dose-range of irbesartan. These studies allowed a comparison of once- or twice-daily regimens at 150 mg/day, comparisons of peak and trough effects, and comparisons of response by gender, age, and race. Two of the seven placebo-controlled trials identified above and two additional placebo-controlled studies examined the antihypertensive effects of irbesartan and hydrochlorothiazide in combination. The seven (7) studies of irbesartan monotherapy included a total of 1915 patients randomized to irbesartan (1-900 mg) and 611 patients randomized to placebo. Once-daily doses of 150 to 300 mg provided statistically and clinically significant decreases in systolic and diastolic blood pressure with trough (24 hour post-dose) effects after 6-12 weeks of treatment compared to placebo, of about 8-10/5-6 and 8-12/5-8 mmHg, respectively. No further increase in effect was seen at dosages greater than 300 mg. The dose-response relationships for effects on systolic and diastolic pressure are shown in Figures 1 and 2. Once-daily administration of therapeutic doses of irbesartan gave peak effects at around 3-6 hours and, in one continuous ambulatory blood pressure monitoring study, and again around 14 hours. This was seen with both once-daily and twice-daily dosing. Trough-to-peak ratios for systolic and diastolic response were generally between 60-70%. In a continuous ambulatory blood pressure monitoring study, once-daily dosing with 150 mg gave trough and mean 24-hour responses similar to those observed in patients receiving twice-daily dosing at the same total daily dose. Analysis of age, gender, and race subgroups of patients showed that men and women, and patients over and under 65 years of age, had generally similar responses. Irbesartan was effective in reducing blood pressure regardless of race, although the effect was somewhat less in blacks (usually a low-renin population). Black patients typically show an improved response with the addition of a low dose diuretic (e.g., 12.5 mg hydrochlorothiazide). 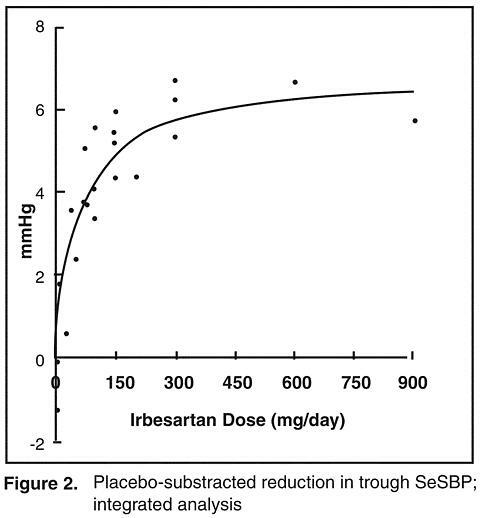 The effect of irbesartan is apparent after the first dose and is close to the full observed effect at 2 weeks. At the end of the 8-week exposure, about 2/3 of the antihypertensive effect was still present 1 week after the last dose. Rebound hypertension was not observed. There was essentially no change in average heart rate in irbesartan-treated patients in controlled trials. The antihypertensive effects of AVALIDE (irbesartan-hydrochlorothiazide) Tablets were examined in 4 placebo-controlled studies of 8-12 weeks in patients with mild-moderate hypertension. These trials included 1914 patients randomized to fixed doses of irbesartan (37.5 to 300 mg) and concomitant hydrochlorothiazide (6.25 to 25 mg). One factorial study compared all combinations of irbesartan (37.5, 100 and 300 mg or placebo) and hydrochlorothiazide (6.25, 12.5, and 25 mg or placebo). The irbesartan-hydrochlorothiazide combinations of 75/12.5 mg and 150/12.5 mg were compared to their individual components and placebo in a separate study. A third study investigated the ambulatory blood pressure responses to irbesartan-hydrochlorothiazide (75/12.5 mg and 150/12.5 mg) and placebo after 8 weeks of dosing. Another trial investigated the effects of the addition of irbesartan (75 mg) in patients not controlled on hydrochlorothiazide (25 mg) alone. In controlled trials, the addition of irbesartan 150-300 mg to hydrochlorothiazide doses of 6.25, 12.5 or 25 mg produced further dose-related reductions in blood pressure of 8-10/3-6 mmHg, comparable to those achieved with the same monotherapy dose of irbesartan. The addition of hydrochlorothiazide to irbesartan produced further dose-related reductions in blood pressure at trough (24 hours post-dose) of 5-6/2-3 mmHg (12.5 mg) and 7-11/4-5 mmHg (25 mg), also comparable to effects achieved with hydrochlorothiazide alone. Once-daily dosing with 150 mg irbesartan and 12.5 mg hydrochlorothiazide, 300 mg irbesartan and 12.5 mg hydrochlorothiazide, or 300 mg irbesartan and 25 mg hydrochlorothiazide produced mean placebo-adjusted blood pressure reductions at trough (24 hours post-dosing) of about 13-15/7-9, 14/9-12, and 19-21/11-12 mmHg, respectively. Peak effects occurred at 3-6 hours, with the trough-to-peak ratios >65%. In another study, irbesartan (75-150 mg) or placebo was added on a background of 25 mg hydrochlorothiazide in patients not adequately controlled (SeDBP 93-120 mmHg) on hydrochlorothiazide (25 mg) alone. The addition of irbesartan (75-150 mg) gave an additive effect (systolic/diastolic) at trough (24 hours post-dosing) of 11/7 mmHg. There was no difference in response for men and women or in patients over or under 65 years of age. Black patients had a larger response to hydrochlorothiazide than non-black patients and a smaller response to irbesartan. The overall response to the combination was similar for black and non-black patients. AVALIDE (irbesartan-hydrochlorothiazide) Tablets is indicated for the treatment of hypertension. This fixed dose combination is not indicated for initial therapy (see DOSAGE AND ADMINISTRATION ). AVALIDE is contraindicated in patients who are hypersensitive to any component of this product. Drugs that act directly on the renin-angiotensin system can cause fetal and neonatal morbidity and death when administered to pregnant women. Several dozen cases have been reported in the world literature in patients who were taking angiotensin-converting enzyme inhibitors. When pregnancy is detected, AVALIDE should be discontinued as soon as possible. Mothers whose embryos and fetuses are exposed to an angiotensin II receptor antagonist only during the first trimester should be so informed. Nonetheless, when patients become pregnant, physicians should have the patient discontinue the use of AVALIDE (irbesartan-hydrochlorothiazide) as soon as possible. Rarely (probably less often than once in every thousand pregnancies), no alternative to a drug acting on the renin-angiotensin system will be found. In these rare cases, the mothers should be apprised of the potential hazards to their fetuses, and serial ultrasound examinations should be performed to assess the intraamniotic environment. If oligohydramnios is observed, AVALIDE should be discontinued unless it is considered life-saving for the mother. Contraction stress testing (CST), a non-stress test (NST), or biophysical profiling (BPP) may be appropriate depending upon the week of pregnancy. Patients and physicians should be aware, however, that oligohydramnios may not appear until after the fetus has sustained irreversible injury. Infants with histories of in utero exposure to an angiotensin II receptor antagonist should be closely observed for hypotension, oliguria, and hyperkalemia. If oliguria occurs, attention should be directed toward support of blood pressure and renal perfusion. Exchange transfusion or dialysis may be required as a means of reversing hypotension and/or substituting for disordered renal function. When pregnant rats were treated with irbesartan from day 0 to day 20 of gestation (oral doses of 50, 180, and 650 mg/kg/day), increased incidences of renal pelvic cavitation, hydroureter and/or absence of renal papilla were observed in fetuses at doses >/=50 mg/kg/day [approximately equivalent to the maximum recommended human dose (MRHD), 300 mg/day, on a body surface area basis]. Subcutaneous edema was observed in fetuses at doses >/=180 mg/kg/day (about 4 times the MRHD on a body surface area basis). As these anomalies were not observed in rats in which irbesartan exposure (oral doses of 50, 150 and 450 mg/kg/day) was limited to gestation days 6-15, they appear to reflect late gestational effects of the drug. In pregnant rabbits, oral doses of 30 mg irbesartan/kg/day were associated with maternal mortality and abortion. Surviving females receiving this dose (about 1.5 times the MRHD on a body surface area basis) had a slight increase in early resorptions and a corresponding decrease in live fetuses. Irbesartan was found to cross the placental barrier in rats and rabbits. Studies in which hydrochlorothiazide was administered to pregnant mice and rats during their respective periods of major organogenesis at doses up to 3000 and 1000 mg/kg/day, respectively, provided no evidence of harm to the fetus. A development toxicity study was performed in rats with doses of 50/50 and 150/150 mg/kg/day irbesartan-hydrochlorothiazide. Although the high dose combination appeared to be more toxic to the dams than either drug alone, there did not appear to be an increase in toxicity to the developing embryos. Excessive reduction of blood pressure was rarely seen in patients with uncomplicated hypertension treated with irbesartan alone (<0.1%) or with irbesartan-hydrochlorothiazide (approximately 1%). Initiation of antihypertensive therapy may cause symptomatic hypotension in patients with intravascular volume- or sodium-depletion, e.g., in patients treated vigorously with diuretics or in patients on dialysis. Such volume depletion should be corrected prior to administration of antihypertensive therapy. Lithium generally should not be given with thiazides (see PRECAUTIONS: Drug Interactions: Hydrochlorothiazide: Lithium) . In double-blind clinical trials of various doses of irbesartan and hydrochlorothiazide, the incidence of hypertensive patients who developed hypokalemia (serum potassium <3.5 mEq/L) was 7.5% versus 6.0% for placebo; the incidence of hyperkalemia (serum potassium >5.7 mEq/L) was <1.0% versus 1.7% for placebo. No patient discontinued due to increases or decreases in serum potassium. Overall, the combination of irbesartan and hydrochlorothiazide had no effect on serum potassium. Higher doses of irbesartan ameliorated the hypokalemic response to hydrochlorothiazide. Interference with adequate oral electrolyte intake will also contribute to hypokalemia. Hypokalemia may cause cardiac arrhythmia and may also sensitize or exaggerate the response of the heart to the toxic effects of digitalis (e.g., increased ventricular irritability). The antihypertensive effects of the drug may be enhanced in the post sympathectomy patient. As a consequence of inhibiting the renin-angiotensin-aldosterone system, changes in renal function may be anti-cipated in susceptible individuals. In patients whose renal function may depend on the activity of the renin-angiotensin-aldosterone system (e.g., patients with severe congestive heart failure), treatment with angiotensin-converting enzyme inhibitors has been associated with oliguria and/or progressive azotemia and (rarely) with acute renal failure and/or death. Irbesartan would be expected to behave similarly. In studies of ACE inhibitors in patients with unilateral or bilateral renal artery stenosis, increases in serum creatinine or BUN have been reported. There has been no known use of irbesartan in patients with unilateral or bilateral renal artery stenosis, but a similar effect should be anticipated. A patient receiving AVALIDE (irbesartan-hydrochlorothiazide) Tablets should be cautioned that lightheadedness can occur, especially during the first days of therapy, and that it should be reported to the prescribing physician. The patients should be told that if syncope occurs, AVALIDE should be discontinued until the physician has been consulted. No significant drug-drug pharmacokinetic (or pharmacodynamic) interactions have been found in interaction studies with hydrochlorothiazide, digoxin, warfarin, and nifedipine. In vitro studies show significant inhibition of the formation of oxidized irbesartan metabolites with the known cytochrome CYP 2C9 substrates/inhibitors sulphenazole, tolbutamide and nifedipine. However, in clinical studies the consequences of concomitant irbesartan on the pharmacodynamics of warfarin were negligible. Concomitant nifedipine or hydrochlorothiazide had no effect on irbesartan pharmacokinetics. Based on in vitro data, no interaction would be expected with drugs whose metabolism is dependent upon cytochrome P450 isozymes 1A1, 1A2, 2A6, 2B6, 2D6, 2E1, or 3A4. In separate studies of patients receiving maintenance doses of warfarin, hydrochlorothiazide, or digoxin, irbesartan administration for 7 days had no effect on the pharmacodynamics of warfarin (prothrombin time) or the pharmacokinetics of digoxin. The pharmacokinetics of irbesartan were not affected by coadministration of nifedipine or hydrochlorothiazide. Cholestyramine And Colestipol Resins: absorption of hydrochlorothiazide is impaired in the presence of anionic exchange resins. Single doses of either cholestyramine or colestipol resins bind the hydrochlorothiazide and reduce its absorption from the gastrointestinal tract by up to 85 and 43 percent, respectively. Lithium: should not generally be given with diuretics. Diuretic agents reduce the renal clearance of lithium and add a high risk of lithium toxicity. Refer to the package insert for lithium preparations before use of such preparations with AVALIDE (irbesartan-hydrochlorothiazide) Tablets. Non-steroidal Anti-inflammatory Drugs: in some patients, the administration of a non-steroidal anti-inflammatory agent can reduce the diuretic, natriuretic, and antihypertensive effects of loop, potassium-sparing and thiazide diuretics. Therefore, when AVALIDE and non-steroidal anti-inflammatory agents are used concomitantly, the patient should be observed closely to determine if the desired effect of the diuretic is obtained. No carcinogenicity studies have been conducted with the irbesartan-hydrochlorothiazide combination. Irbesartan-hydrochlorothiazide was not mutagenic in standard in vitro tests (Ames microbial test and Chinese hamster mammalian-cell forward gene-mutation assay). Irbesartan-hydrochlorothiazide was negative in tests for induction of chromosomal aberrations ( vitro --human lymphocyte assay; in vivo --mouse micronucleus study). The combination of irbesartan and hydrochlorothiazide has not been evaluated in definitive studies of fertility. No evidence of carcinogenicity was observed when irbesartan was administered at doses of up to 500/1000 mg/kg/day (males/females, respectively) in rats and 1000 mg/kg/day in mice for up to two years. For male and female rats, 500 mg/kg/day provided an average systemic exposure to irbesartan (AUC 0-24hours , bound plus unbound) about 3 and 11 times, respectively, the average systemic exposure in humans receiving the maximum recommended dose (MRD) of 300 mg irbesartan/day, whereas 1000 mg/kg/day (administered to females only) provided an average systemic exposure about 21 times that reported for humans at the MRD. For male and female mice, 1000 mg/kg/day provided an exposure to irbesartan about 3 and 5 times, respectively, the human exposure at 300 mg/day. Irbesartan was not mutagenic in a battery of in vitro tests (Ames microbial test, rat hepatocyte DNA repair test, V79 mammalian-cell forward gene-mutation assay). Irbesartan was negative in several tests for induction of chromosomal aberrations ( in vitro -human lymphocyte assay; in vivo -mouse micronucleus study). Irbesartan had no adverse effects on fertility or mating of male or female rats at oral doses </=650 mg/kg/day, the highest dose providing a systemic exposure to irbesartan (AUC 0-24hours , bound plus unbound) about 5 times that found in humans receiving the maximum recommended dose of 300 mg/day. Thiazides appear in human milk. Because of the potential for adverse effects on the nursing infant, a decision should be made whether to discontinue nursing or discontinue the drug, taking into account the importance of the drug to the mother. Clinical studies of AVALIDE (irbesartan-hydrochlorothiazide) did not include sufficient numbers of subjects aged 65 and over to determine whether they respond differently from younger subjects. Other reported clinical experience has not identified differences in responses between the elderly and younger patients. In general, dose selection for an elderly patient should be cautious, usually starting at the low end of the dosing range, reflecting the greater frequency of decreased hepatic, renal, or cardiac function, and of concomitant disease or other drug therapy. AVALIDE has been evaluated for safety in 898 patients treated for essential hypertension. In clinical trials with AVALIDE, no adverse experiences peculiar to this combination drug product have been observed. Adverse experiences have been limited to those that were reported previously with irbesartan and/or hydrochlorothiazide (HCTZ). The overall incidence of adverse experiences reported with the combination was comparable to placebo. In general, treatment with AVALIDE was well tolerated. For the most part, adverse experiences have been mild and transient in nature and have not required discontinuation of therapy. In controlled clinical trials, discontinuation of AVALIDE therapy due to clinical adverse experiences was required in only 3.6%. This incidence was significantly less (p=0.023) than the 6.8% of patients treated with placebo who discontinued therapy. The following adverse events were also reported at a rate of 1% or greater, but were as, or more, common in the placebo group: headache, sinus abnormality, cough, URI, pharyngitis, diarrhea, rhinitis, urinary tract infection, rash, anxiety/nervousness, and muscle cramp. Special Senses: vision disturbance, hearing abnormality, ear infection, ear pain, conjunctivitis. The following have been very rarely reported in post-marketing experience: urticaria; angioedema (involving swelling of the face, lips, pharynx, and/or tongue). Hyperkalemia has been rarely reported. Very rare cases of jaundice have been reported with irbesartan. In controlled clinical trials, clinically important changes in standard laboratory parameters were rarely associated with administration of AVALIDE (irbesartan-hydrochlorothiazide) Tablets. Creatinine, Blood Urea Nitrogen: Minor increases in blood urea nitrogen (BUN) or serum creatinine were observed in 2.3 and 1.1 percent, respectively, of patients with essential hypertension treated with AVALIDE alone. No patient discontinued taking AVALIDE due to increased BUN. One patient discontinued taking AVALIDE due to a minor increase in serum creatinine. Hemoglobin: Mean decreases of approximately 0.2 g/dL occurred in patients treated with AVALIDE alone, but were rarely of clinical importance. This compared to a mean of 0.4 g/dL in patients receiving placebo. No patients were discontinued due to anemia. Liver Function Tests: Occasional elevations of liver enzymes and/or serum bilirubin have occurred. In patients with essential hypertension treated with AVALIDE alone, one patient was discontinued due to elevated liver enzymes. No data are available in regard to overdosage in humans. However, daily doses of 900 mg for 8 weeks were well tolerated. The most likely manifestations of overdosage are expected to be hypotension and tachycardia; bradycardia might also occur from overdose. Irbesartan is not removed by hemodialysis. To obtain up-to-date information about the treatment of overdosage, a good resource is a certified Regional Poison-Control Center. Telephone numbers of certified poison-control centers are listed in the Physicians' Desk Reference (PDR). In managing overdose, consider the possibilities of multiple-drug interactions, drug-drug interactions, and unusual drug kinetics in the patient. Laboratory determinations of serum levels of irbesartan are not widely available, and such determinations have, in any event, no established role in the management of irbesartan overdose. Acute oral toxicity studies with irbesartan in mice and rats indicated acute lethal doses were in excess of 2000 mg/kg, about 25- and 50-fold the maximum recommended human dose (300 mg) on a mg/m 2 basis, respectively. The most common signs and symptoms of overdose observed in humans are those caused by electrolyte depletion (hypokalemia, hypochloremia, hyponatremia) and dehydration resulting from excessive diuresis. If digitalis has also been administered, hypokalemia may accentuate cardiac arrhythmias. The degree to which hydrochlorothiazide is removed by hemodialysis has not been established. 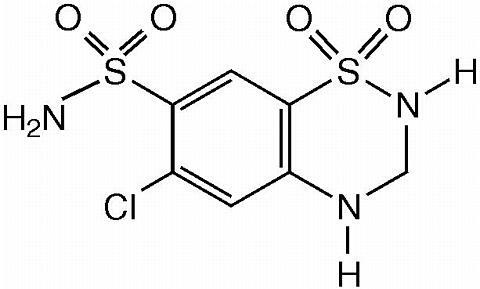 The oral LD 50 of hydrochlorothiazide is greater than 10 g/kg in both mice and rats. The recommended initial dose of irbesartan is 150 mg once daily. Patients requiring further reduction in blood pressure should be titrated to 300 mg once daily. A lower initial dose of irbesartan (75 mg) is recommended in patients with depletion of intravascular volume (e.g., patients treated vigorously with diuretics or on hemodialysis) (see WARNINGS: Hypotension in Volume- or Salt-depleted Patients ). Patients not adequately treated by the maximum dose of 300 mg once daily are unlikely to derive additional benefit from a higher dose or twice-daily dosing. The side effects (see WARNINGS ) of irbesartan are generally rare and apparently independent of dose; those of hydrochlorothiazide are a mixture of dose-dependent (primarily hypokalemia) and dose-independent phenomena (e.g., pancreatitis), the former much more common than the latter. Therapy with any combination of irbesartan and hydrochlorothiazide will be associated with both sets of dose-independent side effects. AVALIDE (irbesartan-hydrochlorothiazide) Tablets may be administered with other antihypertensive agents. A patient whose blood pressure is inadequately controlled by irbesartan or hydrochlorothiazide alone may be switched to once-daily AVALIDE. Recommended doses of AVALIDE, in order of increasing mean effect, are (irbesartan-hydrochlorothiazide) 150/12.5 mg, 300/12.5 mg, and 300/25 mg. The largest incremental effect will likely be in the transition from monotherapy to 150/12.5 mg. (See CLINICAL PHARMACOLOGY: Clinical Studies ). It takes 2-4 weeks for the blood pressure to stabilize after a change in the dose of AVALIDE. The usual dose of AVALIDE is one tablet once daily. The maximal antihypertensive effect is attained about 2-4 weeks after initiation of therapy. The usual regimens of therapy with AVALIDE may be followed as long as the patient's creatinine clearance is >30 mL/min. In patients with more severe renal impairment, loop diuretics are preferred to thiazides, so AVALIDE is not recommended. No dosage adjustment is necessary in patients with hepatic impairment.